State Rep. Bruce Braley, the Democratic candidate for U.S. Senate, holds up his old work boots at the Iowa State Fairgrounds in Des Moines in 2013. We recently published a forecast that described the GOP as more likely than not to win the U.S. Senate in November. But our analysis was less bullish on Republicans’ prospects of flipping the seat in Iowa currently held by Democratic Sen. Tom Harkin, who is retiring. There, Democrats appeared to have a strong candidate in Rep. Bruce Braley, who has cleared his primary field. Republicans, meanwhile, face a contentious primary with a number of candidates who have never won races for statewide or federal office. After we published our forecast, the Republican PAC America Rising released a video of Braley, who represents the 1st Congressional District, referring to Iowa’s other senator, Chuck Grassley, as a “farmer from Iowa who never went to law school.” The comment might seem ill-considered in a state that generates the fourth-highest income per capita from crop production. It has sparked plenty of attention in the local news media; the Des Moines Register, Iowa’s newspaper of record, has published at least 14 pieces on Braley’s comment. Is Braley’s remark another thing for Democrats to worry about — or is it the latest example of a purported “game changer” that will prove to have little effect? Gaffes often resonate more with the news media than with voters. A reasonably large body of political science research has found their impact is usually overstated by those who cover campaigns. Take the examples of two other incidents that Braley’s comment has been compared to. The first is Barack Obama’s remark at a San Francisco fundraiser about voters who “cling to guns and religion,” which was first reported by the journalist Mayhill Fowler on Apr. 11, 2008. Then-candidate Obama’s comment generated more than 2,500 news articles by the end of that month, according to a search of records at NewsLibrary.com. But it had no effect on the polls, either nationally or in Pennsylvania, which was the next state to vote in the Obama vs. Clinton Democratic primary. Instead, Hillary Clinton’s win in Pennsylvania was in line with demographic trends from earlier primaries. What about Mitt Romney’s “47 percent” comments during the general election campaign in 2012? They barely moved the polls; there was a swing of perhaps one percentage point toward President Obama. These examples, however — and most others from the political science literature — are drawn from presidential campaigns. Races for the Senate differ in some important ways. First, the candidates are usually less well-known to voters. Braley has strong name recognition in the northeastern quadrant of Iowa, which he represents in Congress. But statewide, 46 percent of Iowans hadn’t known enough about him to form an opinion, according to a Quinnipiac University poll conducted before the release of the “farmer” video. For some of them, the “farmer” comment will represent their first impression of the candidate. The second difference is that the presidential race is never a sideshow. Even contests as lopsided as Reagan vs. Mondale in 1984 generate a disproportionate amount of media attention. By contrast, senatorial campaigns compete against one another for scarce resources, such as funds from campaign committees, and attention from activists and the national press. Braley’s remark might not matter much unto itself. But it’s plausible that it could spur activists and the news media into evaluating the Iowa race differently. That could matter, because Iowa’s competitiveness was previously in some doubt. In the abstract, a race with no incumbent in a swing state in a Republican-leaning national climate would represent a good opportunity for the GOP. However, parties sometimes squander these opportunities by failing to nominate strong candidates or by failing to provide marginal ones with sufficient support. The race was only on the fringe of being competitive as of early 2006; Virginia had not yet begun to behave as a purple state, and Allen maintained a double-digit lead in all nonpartisan polls. Then, on Aug. 14, a video was released by Webb’s campaign of Allen referring to S.R. Sidarth, an Indian-American volunteer for the Webb campaign, by the term “macaca.” The word, which can be considered a racial slur, created a frenzy of attention, and Webb moved to within 3 to 5 percentage points of Allen in polls conducted immediately afterward by SurveyUSA and Rasmussen Reports. Just as important as the gaffe itself was its staying power. That may have had a lot to do with the netroots. The political scientist David Karpf studied the Virginia campaign in a 2009 paper. He found that the number of Daily Kos diaries on the campaign increased tenfold after Allen’s comment. However, instead of reverting to its baseline (as was the case following a gaffe by Rep. Michele Bachmann that October), the amount of netroots attention on the Virginia campaign remained at a high level for the rest of the year. You can also see the lasting effects of Allen’s gaffe on grass-roots support in campaign contributions. In the chart below, I’ve plotted the cumulative total of individual, itemized contributions to the Webb campaign throughout the 2006 cycle. 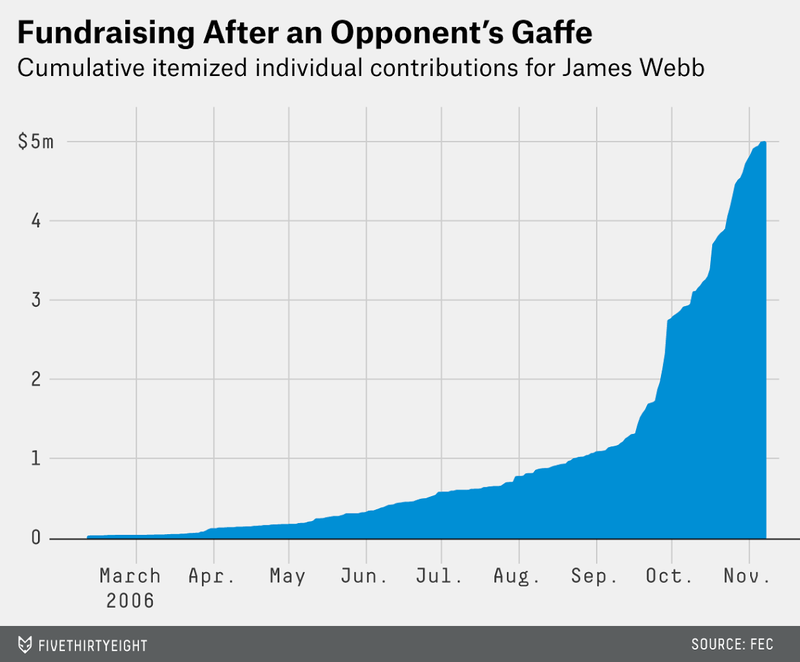 There is an inflection point in the chart, after which time Webb began to raise money at a much more vigorous pace. However, the effect of Allen’s gaffe was not instantaneous; instead, it came a few weeks later (in particular, toward the end of September as Webb was approaching his quarterly fundraising deadline). Meanwhile, the comment had a long lifespan in the mainstream media. 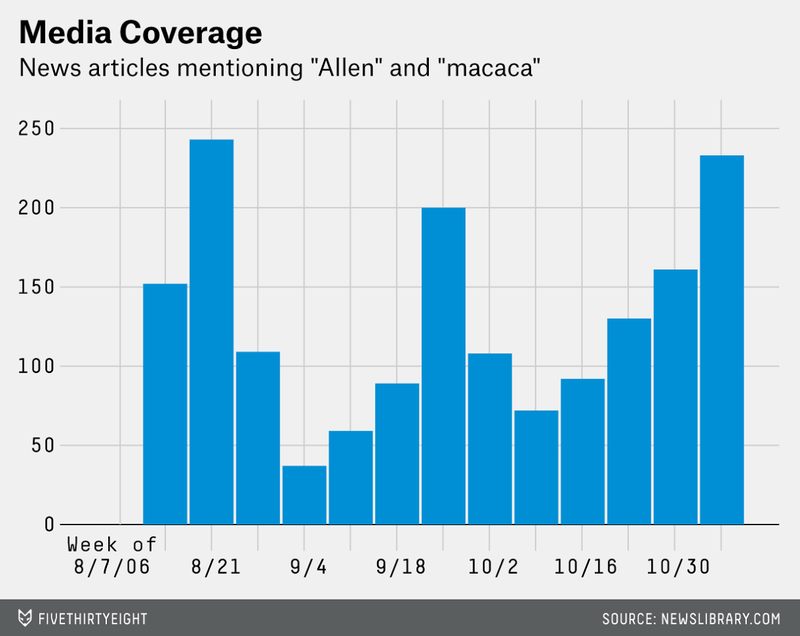 The next chart shows the number of news articles each week that mentioned both “Allen” and “macaca,” according to a search at NewsLibrary.com. Coverage reached a peak during the week of Aug. 21, a week after the release of the video clip on YouTube. But it remained at reasonably high levels from then until the November election. Part of the problem for Allen was that the news media uncovered other instances of racially insensitive remarks in his past, which triggered renewed interest in the “macaca” story. Google searches for the term followed a similar pattern. It’s not easy to separate the impact of Webb’s improved polling, his accelerated fundraising, the higher volume of news media attention devoted to his campaign and the greater attention paid to it by the netroots. These factors probably all contributed to one another in what worked out to be a virtuous cycle for Democrats. On Nov. 7, Webb defeated Allen by about 9,000 votes — and Democrats won exactly enough Senate seats, 51, to take control of the chamber. I want to be clear that this analysis of Virginia represents a case study, rather than a prediction, of how Iowa will turn out. A gaffe swinging the balance in a race is more the exception than the rule. The reason why Allen’s comment mattered in Virginia had to do with three major factors, in my view. First, the race was on the fringe of being competitive before the gaffe. Webb’s campaign wasn’t a lost cause, but Allen was not an easy target, even in a Democratic-leaning environment. Webb probably needed some catalyst to generate more attention for his race and push him over the finish line. Second, the news media found other examples of intemperate or insensitive remarks by Allen, which gave the story life and made it a prism for interpreting the campaign. Third, the gaffe helped to mobilize the Democratic base around Webb’s campaign. Although Webb was already a favorite of the netroots, Allen’s comment dramatically increased their attention on Virginia. And the netroots maintained their heightened attention right up through the November election. I’d argue that the first condition is replicated in Iowa. This was just the sort of race that may have needed an external stimulus to kickstart it into higher levels of activist and news media attention. But it’s unclear whether the second and third conditions will be met. Does Braley have a track record of making remarks that seem elitist, classist or otherwise disparaging of rural life, or will he make such comments in the future? And will Republican activists and officials maintain their focus on Iowa, rather than treating it as a passing fancy? Furthermore, the decisions about which races deserve party resources involve trade-offs. Had Democrats lost Virginia by 9,000 votes in 2006, rather than winning it by that margin, their attention to the state might have seemed imprudent in retrospect. But Iowa is a more plausible option for Republicans than it was a week ago. Braley has made their path to a Senate majority a little more robust.